Seven weeks into the school year and we’re already into the process of determining champions. Two of the seven fall sports, girls’ tennis and soccer, will start state tournament play this week. Fall sports, we hardly knew ye. Seven weeks into the school year and we’re already into the process of determining champions. 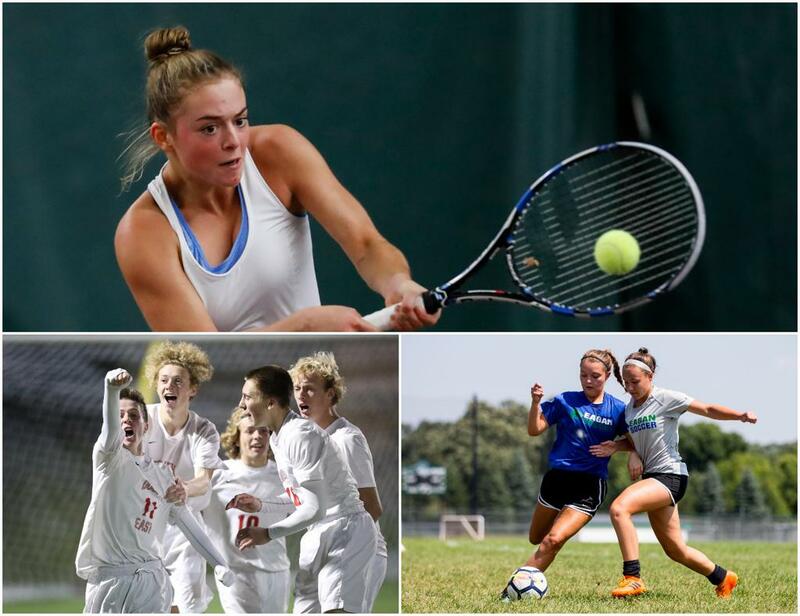 Two of the seven fall sports, girls’ tennis and soccer, will start state tournament play this week and every other sport, save for a few late-season girls’ swimming and diving meets, is into its win-or-go-home postseason. Team competition in girls’ tennis runs Tuesday and Wednesday while the individuals take the court Thursday and Friday. In Class 1A, Blake will be shooting for its fourth consecutive team title and the Bears’ top player, junior Arlina Shen, is the No. 1 seed in the singles field. In Class 2A, Edina will be shooting for its 21st team championship in the past 22 seasons, led by junior Nicole Copeland, who is the defending singles champion and top seed in the singles bracket. The Class 2A tournament takes place at Baseline Tennis Center on the campus of the University of Minnesota, while Class 1A will be held at Reed-Sweatt Family Tennis Center in south Minneapolis. The boys’ and girls’ soccer tournament quarterfinals will be held Tuesday through Thursday. In the boys’ field, Blake heads up the Class 1A bracket, which will be played Wednesday, and Duluth East is the No. 1 seed in Class 2A, with games taking place Thursday. On the girls’ side, Eagan is the top seed in Class 2A and Mahtomedi holds the same position in Class 1A. All four 2A quarterfinals will take place Tuesday and all four 1A quarterfinals on Wednesday. And it’s a busy week for football with the start of section playoffs. The first round for all classes except Class 6A takes place Tuesday, with the second round held on Saturday. The first round of the Class 6A tournament is Friday. 1. Lakeville North (8-0): The best team in the state. 2. Blaine (8-0): The most pleasant surprise of the season. 3. Eden Prairie (7-1): Winners of six in a row and living up to expectations. 4. Woodbury (7-1): One rotten quarter — a 20-point defensive lapse in the second quarter of a Week 2 loss to Roseville — from a possible undefeated season. 5. St. Thomas Academy (5A, 8-0): One of the few Class 5A teams that would fare well against the best of 6A. 6. Champlin Park (6-2): Coach Nick Keenan’s first year at the helm has been a success. 7. Edina (6-2): Tough on both sides of the ball, but lacking big-play ability. 8. Rosemount (6-2): Another team that has found its late-season groove, winning six in a row. 9. East Ridge (5-3): Of the four 6A teams at 5-3, the Raptors’ résumé stands out. 10. Cretin-Derham Hall (5-3): After losing three consecutive, all to teams above them in the metro top 10, the Raiders have won three in a row. Others worthy of consideration: Mounds View (5-3), St. Michael-Albertville (5-3), Buffalo (6-2), Elk River (5A, 7-1). The Minneapolis Washburn senior, the first high school girl to break 17 minutes in a 5K meet, also won the honor in 2017. Strategy and workouts paid off for the Roseville senior in winning the Class 2A state meet in November. Sophomore Grace Ping won her second 1A championship and Perham swept the team titles in Class 1A. The Millers’ star has already had a strong season as a senior. Plus a preview of the cross-country state meet races. ©2019 MN Cross Country Hub | High School Cross Country News / SportsEngine. All Rights Reserved.